Photovoltaic? I think you mean FLOATovoltaic! Floatovoltaics are making a splash and are expected to be worth $2.7 Billion in 2025. What are floatovoltaics? They are photovoltaic solar panels that can float in water, be it the ocean, dams, reservoirs, or canals. They are especially growing in countries like Japan where land mass is more limited than in the States. Japan alone was responsible for 75% of the revenue produced by floating solar panels. The amount of floating photovoltaic systems is expected to double by the end of this year. 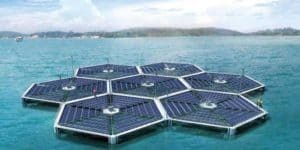 Global Market Insights’s report that these kind of panels “also help to decrease algae growth in stable water and aid in reducing water evaporation.” As of now, the largest floating solar panel system is in Japan. Meanwhile, Europe hopes to produce 1/3 of its energy by 2020. They are currently building their largest floating solar panel array on the Queen Elizabeth II reservoir.